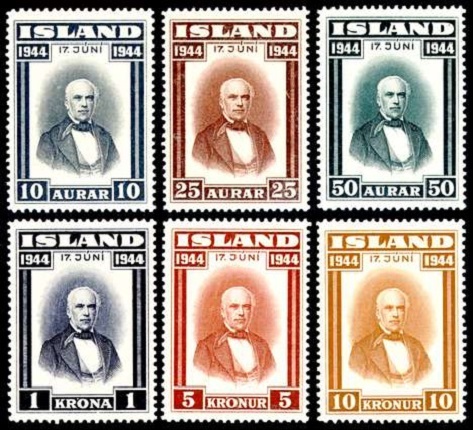 Commemorative Iceland stamps issued during the period from 1938 to 1949 honor significant events in Icelandic history, including one which would alter the destiny of the Icelandic people and their nation. 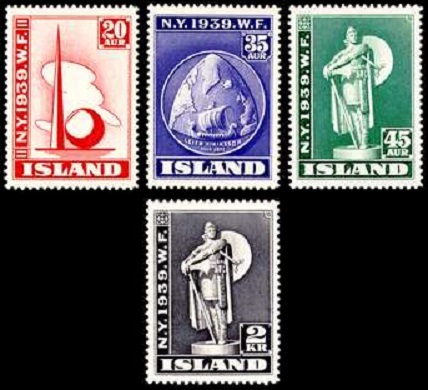 The three pictorial Iceland stamps shown above (Sc. #209-211) were issued on December 1, 1938 to celebrate the 20th Anniversary of Iceland's Personal Union with Denmark and their autonomy in internal affairs (Independence). The common design features the University of Iceland, the country's oldest and largest institution of higher learning. The four pictorial stamps shown above (Sc. #213-216) were issued in 1939 to publicize the New York World's Fair. 20 A. - The Trylon and Perisphere at the New York World's Fair. 35 A. - Leif Ericsson's ship and its route to America. 45 A. - Statue of Thorfinn Karlsefni, located in Philadelphia. A copy of the statue is also located in Reykjavik. 02 K. - Statue of Thorfinn Karlsefni, located in Philadelphia. Thorfinn Karlsefni was the Icelandic explorer that followed Leif Ericsson's route to Vinland in about 1010, in an effort to establish a permanent colony there (presumably in present-day Newfoundland). It is believed that he fathered a child while there, which would be the first child born in the New World. The four New York World's Fair stamps of 1939 shown above (Sc. #232-235) were overprinted "1940" on May 11, 1940 to publicize the second year of the New York World's Fair. 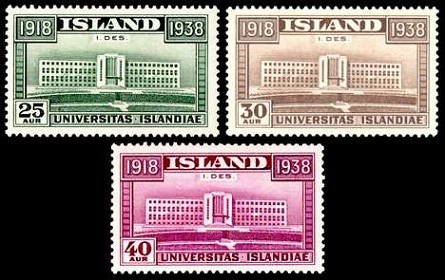 The three pictorial Iceland stamps shown above (Sc. #237-239) were issued on November 7, 1941 to commemorate 700th Anniversary of the death of Snorri Sturluson. The common design features the Statue of Snorri Sturluson in Bergen, Norway. The statue was donated to the Icelandic nation in 1947. Snorri Sturluson (1179-1241) was an Icelandic historian and politician. He was elected three times as the "lawspeaker" or "judge" at the Althing (Icelandic parliament). His writings provide a window into the views and thoughts of pagan Northern Europeans, during a time where historical information is very limited. The six pictorial Iceland stamps shown above (Sc. #240-245) were issued on June 17, 1944 to celebrate the Founding of the Republic of Iceland. On June 17, 1944, the Icelandic parliament voted to sever their union with the Kingdom of Denmark, to abolish their monarchy, and to proclaim a sovereign republic. Sveinn Bjornsson (1881-1952) was then elected as the first President of the Republic of Iceland. The common design features a portrait of Jon Sigurdsson (1811-1879), the leader of Iceland's 19th Century independence movement. 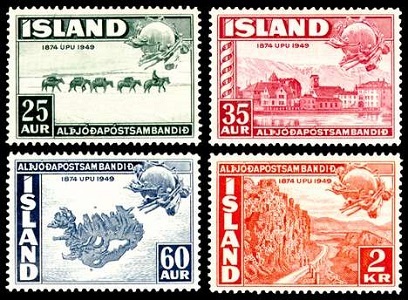 The seven pictorial Iceland stamps shown above (Sc. 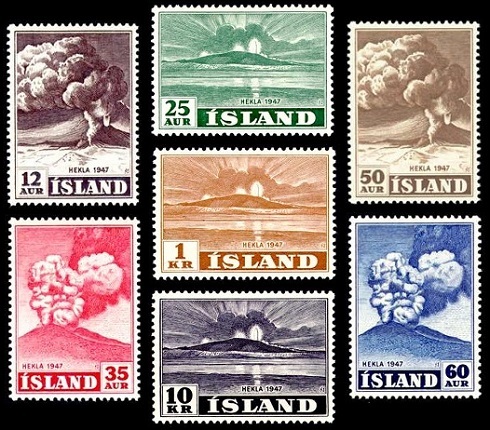 #246-252) were issued on December 3, 1948, featuring three different views of the eruption of Mt. Hekla. Mt. Hekla, in Southern Iceland, is Iceland's most active volcano. This eruption began in March 1947 and lasted until April 1948. The volcano has erupted four times since then, with the last one being in 2000. The four pictorial stamps shown above (Sc. #253-256) were issued on October 9, 1949 to celebrate the 75th Anniversary of the Universal Postal Union. 25 A. - Pack Train and the UPU Monument in Bern. 35 A. - Reykjavik and the UPU Monument in Bern. 60 A. - Map of Iceland and the UPU Monument in Bern. 02 K. - The road to Thingvellir National Park, in Southwestern Iceland, and the UPU Monument in Bern.